Looking for examples of names that can be classic and trendy all at once? Here’s one. 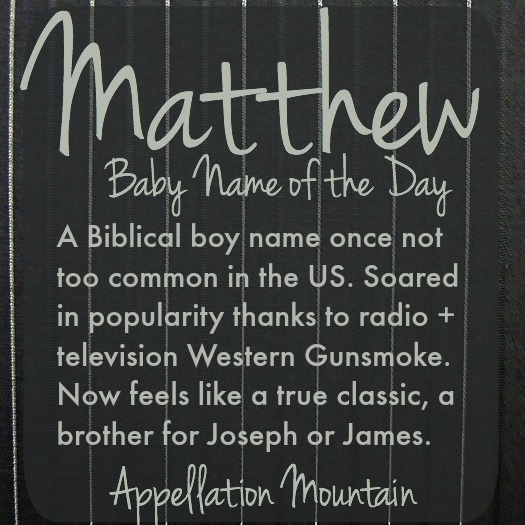 Top Fifteen Week kicks off with Matthew as our Baby Name of the Day. 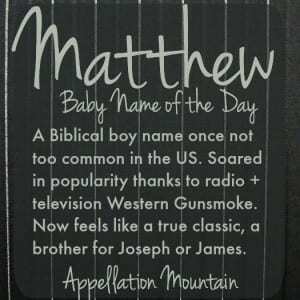 Matthew is a Biblical boy name, from the Hebrew Mattiyahu – gift of God. The first famous bearer of the name was one of the twelve apostles in the New Testament, as well as the author of the first Gospel. Not every one of the apostles’ names is common in the US today, but most of them have the feel of classics – James and John, Philip and Simon, Thomas and Andrew. Unlike well-worn James and John, Matthew sometimes hibernates. In English, the first surge in the name’s use comes in the sixteenth century, after the Protestant Reformation. 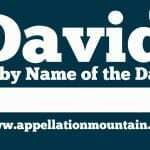 The name is relatively uncommon in the late nineteenth century in the US, ranking in the Top 200. It’s almost bizarre to think of such a classic name as trendy, but it was undeniably lifted by popular culture. Just like Wyatt and Beau feel cowboy cool in 2015, Matthew was once at home on the range. Gunsmoke started out on CBS radio in 1952, and migrated to television in 1955. Matt Dillon was the US marshal of Dodge City, Kansas in the days of the wild, wild West. The series’ run lasted an astonishing twenty years – not counting made-for-tv movies. The character was named Mark in early drafts – another storied Biblical choice – but one much more common at the time. In 1951, Matthew ranked #163 and was slowly rising. By the time Gunsmoke debuted with James Arness in the title role, the name stood at #105, and would break into the US Top 100 the following year. Actors Perry, McConaughey, Damon, Macfayden, Broderick, and Dillon – yes, another Matt Dillon, born in 1964. Athletes like the NFL’s Stafford and MLB’s Kemp. And more … The Simpsons creator Matt Groening and television’s Matt Lauer. And that’s not even counting fictional characters, like Downton Abbey’s handsome heir, Matthew Crawley, or 7th Heaven’s oldest sibling, Matt Camden. It’s no surprise today to meet a dad called Matt. From 1972 through 2007, Matthew ranked in the US Top Ten, peaking at #2 in 1995 and 1996. But look at those numbers – plenty of boys are still being called Matthew, though like William and James, they’re very likely to use their name in full. As of 2013, Matthew stood at #15. Over 13,000 boys were given the name. All of this makes Matthew as versatile as many classic names. Matt is a skater, but Matthew is a scholar. It’s become something of an everyman name. While I was researching this piece, I stumbled on the phrase “the Matthew effect.” In the Gospel of Matthew, the apostle tells us that the rich get richer. (He says it better.) Applied to baby names, it means this: names that are given to lots of boys will likely remain popular for generations, as they’re handed down to sons and grandsons. All of this makes Matthew an evergreen choice for a son. What do you think of Matthew? Is it a great, classic name? Or does this name feel dated? I love Matthew (and Matthias even more!) But I am not fond of Matt. Most Matts that I know are 1-5 years younger than me (1983) and it really dates the nickname for me. But the full name reminds me of Matthew Cuthbert from Anne of Green Gables, and I can’t think of many more wonderful associations than that. I just love Matthew. The soft th sound in the middle gives it such a gentle feel. Matthew came to me in a dream as a name for my youngest and I very nearly did use it. My concern was that my family loves nicknames and my oldest goes by a nickname that I thought it would be inevitable that a Matthew would be called Matt. 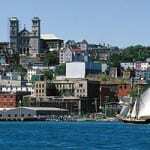 I have never cared for the abrupt sound of Matt. Instead I keep Matthew in my back pocket. I’ll think of it again if I have another boy and maybe it’ll be a better fit then. My boyfriend is a Matthew, and I am the only one who calls him Matt. I’ve always liked the name, seems intelligent to me.